PACIFIC ALLIANCE (1997) The trawler Pacific Alliance sank in rough weather January 18, 1997 approximately 60 miles west of Cape Scott, Vancouver Island. She was on her way from Seattle to Dutch Harbor traveling with the fishing vessel Papado II. Weather deteriorated and winds built to 55 to 60 miles an hour with a following sea of 35 to 40 feet. The two vessels became separated by two or three miles in the heavy weather. At some point the Pacific Alliance radioed the Papado II that they had developed a bad list and needed assistance. Soon after that, all contact was lost. One deceased crewmen from the Pacific Alliance was recovered with a partially zipped survival suit. Three others were never found. Lost were Scott August Carlson, Curtis Miller, Stephen A Brooks and John E Ferry. A tarp, life ring, bucket, EPIRB and two unoccupied life rafts were spotted during the search but weather conditions prevented retrieving any of them. The U S Coast Guard Investigation was not able to determine the exact cause of the disaster but stated the possibility that the unusually large following seas could have flooded the aft deck to the point that the scuppers or freeing ports were not able to drain as fast as the seas were coming on board. The wooden false deck installed outboard of the tanks was thought to have aggravated this circumstance by restricting the outward flow of water at the scuppers. PACIFIC APOLLO (1990) The 167 foot fishing vessel Pacific Apollo sank October 24, 1990 off of the Queen Charlotte Islands in a storm. She was on her way to a Bering Sea crab opening with four crewmen aboard. Lost were Pat Berg, Len Dodge and Terry Goebel. Arthur Stein was the sole survivor. PEARL (1951) The 22 ton 49 foot wooden oil screw tug Pearl foundered in Christie Passage April 8, 1951. PEP (1974) The gas screw Pep foundered and was lost September 30, 1974 at Entrance Island. PIONEER (1898) The 25 ton sealing schooner Pioneer was lost with all hands December 8, 1898 on upper Vancouver Island, British Columbia. 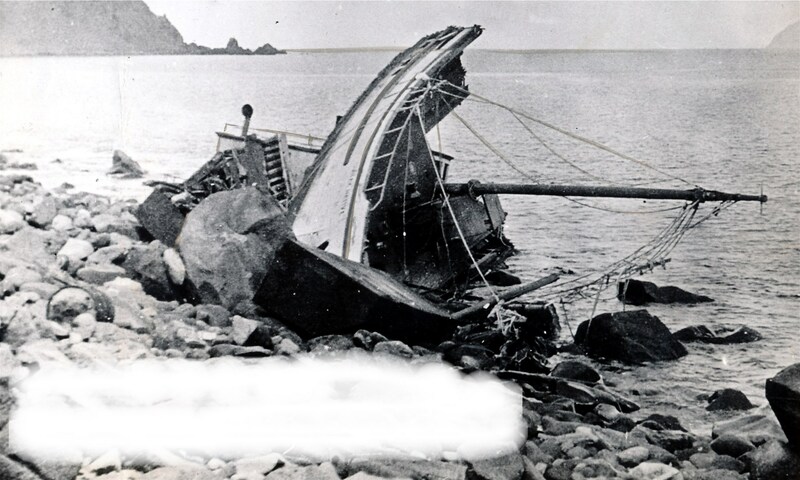 The vessel and her crew were last seen in the Bering Sea in September of 1898. The Pioneer was valued at $45,000 at the time of the disaster. The wreckage and 8 skeletons of those lost were found in 1899 by local Natives.